About three weeks ago, I picked him up from his church school to take him hunting. I had the afternoon off, and I thought it would be fun to spend a little time with him in the woods. I wasn’t expecting to have much luck. It’s hard to hunt with a four year old. But I was expecting to have a great time with my son enjoying the woods, talking about hunting and wildlife. Although I really wanted him to see some wildlife, I didn’t expect much on the hunting front, but I hoped for a lot on the father-son front. When we arrived at the hunting camp, we went inside the cabin to change our clothes. It was like dressing in a miniature mirror. I would slide one leg into my camo long-johns and he would slide his leg into his. I would slide my arm into my shirt and he would slide his arm into his. I slipped on my rubber boots. He slipped on his. He never took his eyes off me and he put on each article of clothing exactly as I did and at the same pace I did. I was already having fun just watching a little version of me dress himself in the chair across from me. It made me wonder if I was ever a reflection of my dad as he got ready to hunt. I imagine so, but I could not remember. After we were dressed, I pulled out my pack to take inventory. He stared at me intently watching every move as I checked off my list. I held up each item in my pack one by one. “Never go in the woods without water,” I said as I held up a bottle of water. “Yessir. Check. We got water,” he said with a smile. “Yea boy, we got water. Knife,” I followed. “Check. Never go in the woods without a knife,” he said. He was catching on. “Apple,” I kept going, getting a huge kick out of how serious he was taking the whole process. “Apple. Check. Never go in the woods without an apple. Hey daddy, why don’t you never go in the woods without an apple,” he asked un-assuredly after having checked it off so assuredly. “You have to take food in the woods and apples freshen your breath better than toothpaste. Deer can smell toothpaste and apples, but they love apples and hate toothpaste,” I explained with a smile. “Apple. Check.” He got it. He looked up at me quizzically, “if we get lost why don’t we just follow the trail back to the cabin,” he said simply. I laughed to myself. He had a point. Kids see things with simple glasses that look straight through the complexities of adulthood. Loading the pack afforded me some quality time to kill before we began our long sit in the stand. One of the hardest things do when hunting with a kid is keep them from getting bored while sitting in the stand. The Red power Ranger who rides a Transformer to crush all the Pokemon is only going to sit still so long. So, I wait as long as possible preparing and teaching before I take my kids up in the stand. 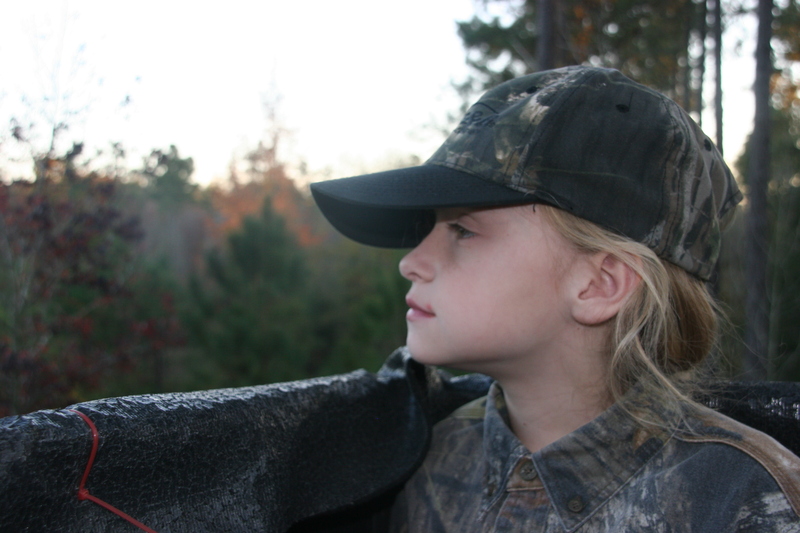 Nevertheless, hunting is about patience and hunting with children is about developing their patience. My son has taught me that it takes patience to build patience. Each time in the stand builds a little more patience. I laugh when I hear other parents ordering their children to be patient. Most of them are doing so because they have lost their own. Patience is not something that can be commanded; it is something that must be experienced. Let’s go get us one then,” I said as matter-of-factly as if it were going to happen. That is the attitude I want to teach my son. Think positive. Let the hunt come to you and eventually it will. Every time you walk in the woods, if you are prepared you have a chance to get a buck. One thing is certain, if you do not walk in the woods or you are not prepared, you have no chance at all. I knew he believed this because the entire walk to the stand he was telling me about the big eight-point buck we were going to see and how he was going to shoot it. “Now dad, when we see the buck, you gotta let me shoot it. It’s my turn. I have not shot a buck before and you have, so that means it’s my turn,” he was as convinced as a Luke Skywalker was that he was going to defeat Darth Vader in return of the Jedi that he was going to see a buck. He was even more convinced that he was going to shoot it. “Got it. You can shoot if it’s a good one,” I told him knowing full well that our chances of seeing a buck were limited, not because we were hunting in a bad place or because it was a bad time of year. It’s just hard to bring a buck into a field with a four year old that thinks he is Incredible Hulk wearing Spiderman’s suit armed with death laser eyes and a Luke Skywalker’s light saber. We headed out for the stand. I had my 264 win mag., which is about six inches longer than he is tall, slung over my shoulder and he had his single shot .22, which is just shorter that he is, slung over his. Even though he has never shot his gun, he wanted to carry it, just like I carried mine. What a pair, my boy and I walking through the woods. I looked down at him and it took me back in time to when I was his age. “Well, then, let’s go shoot one,” I said to him with a chuckle. “We’ll get ‘em,” he replied confidently. Sure enough, we had been sitting in the stand for about a half an hour when Spiderman, Hulk and the rest of the League of Justice had to pee. “You gotta what,” I asked him having made him pee at least three times while we were dressing and loading our pack? “Yessir daddy, I gotta go,” he said sheepishly. “Can you wait,” I asked in vain knowing that his bladder only has about five minutes of capacity but hoping he may somehow have developed in the last five minutes a fraternity boy tolerance to urination. As I helped him use the bathroom through the metal grates of the stand, I was a bit disappointed. There was a part of me that believed him when he said we were going to see a big buck that day. He seemed to truly believe it. There is something so pure about the hope in a boy’s eyes that it is contagious and it had stricken me like the Swine Flu. I really thought we were going to see a buck, but now that my son had just marked its territory, I knew there was no way. Using the bathroom anywhere near a deer stand (ever) is the kiss of death. Anyone who has ever hunted whitetail will say as much. But, the boy had to go, so I let him go. What can you do? After two years of telling him over and over not to go in his pants, I could not go back now. Besides there is no difference whether you go in your pants or through the grates of the stand. Once the scent is released, the deer will smell it for days and the hunt is over. So, he went. 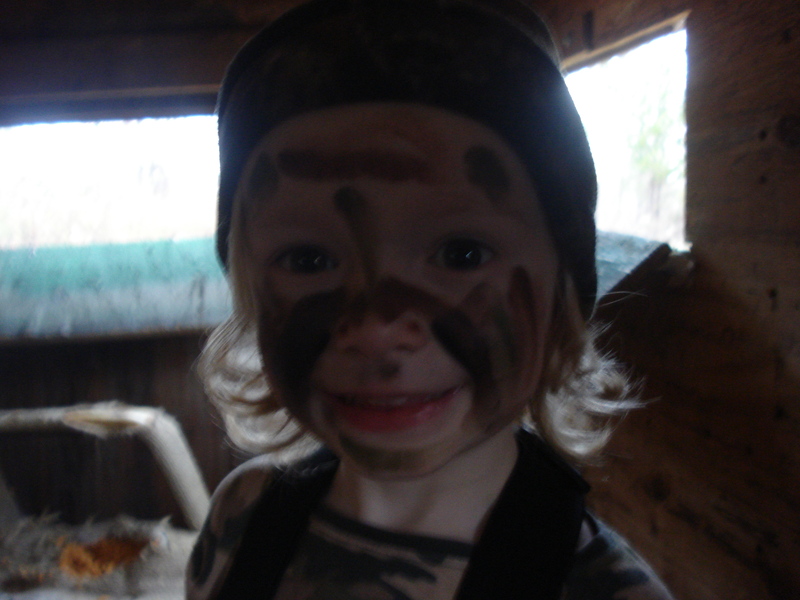 After he was finished, I helped him get his pants up and he sat back down next to me, “Dad, we are gonna see a big buck today,” he looked up at me and through his cammo face-mask all I could see were two big blue eyes of hope. He had a look of hope that I had long forgotten. It was pure hope, a look that had not yet been jaded by any of life’s disappointment. It inspired me. My thoughts drifted into daydreams of “you never know’s.” I was thinking about all the times when I was around his age that I dreamed things would happen so hard they seemed to happen. I felt feelings I hadn’t had for many years. I remembered times that I had been wading in the Ocean with a baited hook with an old Pen reel for what seemed like hours. I waited through the rise and fall of a high tide with my dad telling me to check the bait. I just knew I shouldn’t. You never know. I thought if I reeled in that line to check, it would be at that very moment that a Whiting or a Spot-tail would cruise by the place where my bait had been sitting and I would miss him. That’s what teaches you patience – hope – you never know. I was startled out of my memories like a fish slamming my bait in the surf after that long wait by the sound of the bushes rustling 10 yards in front of our stand. “Did you hear that,” I asked my boy as I shifted my body to look. “That’s not a squirrel. I think it’s a deer,” I whispered to him as he looked up. “SHHHH.” I looked back at him as he stared intently into the woods. “It’s a buck,” he said, not in a whisper. “SHHH,” I paused. “Maybe,” I paused again listening intently. “We need to be as quiet as possible,” I hushed almost inaudibly. “Got it,” he whispered back as quietly as I did. I saw its front legs first. An overhanging tree branch hid its head, which quickly emerged from the woods, adorned with antlers. “I know.” It stood there ten yards from us on an old logging road. I was shocked. It stood ten yards from where my son had not ten minutes ago used the bathroom. Broadside, eight points, wide but not tall, it stood staring right up at us. “It’s a buck daddy, shoot it,” my son whispered as if he were a seasoned hunting guide. He was so excited he had forgotten about the fact that it was his turn to shoot a buck. It was a nice buck by any measure. Its antlers were outside of the ears. It had eight, nice symmetric points, but it was young, maybe 2 and half years old. It still had a lot of growing to do. It was not yet a shooter. “Shoot ‘em daddy,” my boy exclaimed in a whisper so loud I could not believe the buck did not bolt for cover. It just stood there. It was a bow-hunter’s dream shot. He was giving my son the best look he may ever have at a buck at such close range. He was burning himself into my son’s memory. I could see it in my son’s wide-eyes. “I can’t shoot him, son. He’s too young,” I whispered. “What do you mean he’s too young. It’s a buck. Shoot ‘em,” all he knew about hunting was that we were out there for bucks and we were staring at a buck ten yards away. It was close. It had eight points. It had a good spread. To him this buck was huge, the biggest buck he had ever seen – his first buck. In a voice that I can only describe as a “letting him down voice,” I whispered back, “I can’t.” I knew we shouldn’t take this buck. He had many better years ahead of him. “Son, I can’t shoot him,” I whispered one more time in a voice that hoped he would understand. I turned to look at him hoping I wouldn’t see what I knew I would, the face of dejection. I laughed so hard it doesn’t take a lot of imagination to know what that buck did. My son’s first buck was a great buck for him and for me.